Are you on the market for a trampoline? Are you trying to add a little excitement to the backyard for the family? Trampolines are a lot of fun, but can also be a lot of work, if you don’t know what you’re looking for. With so many choices and types on the market, it can be a little overwhelming picking out the right one. For instance, if you have a large family, then picking out a heavy weight capacity trampoline will make much more sense, then if only two people will be using a trampoline with a 300 lb weight limit. The Consumer Product Safety Commission says that trampolines caused over 100,000 injuries in 2014, with 75 percent of those injuries were caused because more than one person was jumping on a trampoline at the same time. So does that mean trampolines are dangerous and you shouldn’t buy one for the kids? Absolutely not, that means there are some things to consider before you go out buy one, but also finding the right one, will go a long way in keeping you and your family safe. Trampolines come in all shapes and weight systems, for instance, a trampoline for overweight people won’t be necessary for a family with lighter children. Small families won’t need a trampoline with high weight limits as a family of 4 or 6. 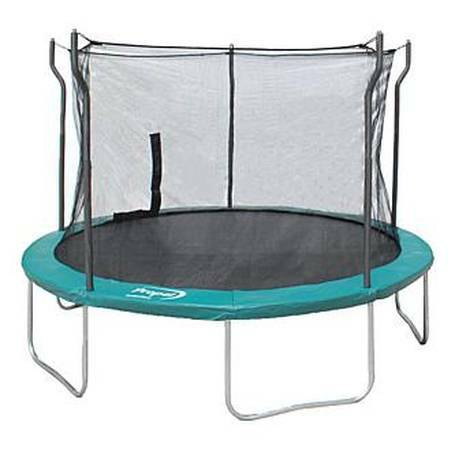 Circular: These are the least expensive types, with an even spring distribution that gravitates the user towards the center for backyard jumping fun. Octagonal: These fall around the mid-range price-point with a large jumping surface that gives a trampoline user much more natural body position. Rectangular: The most expensive type for more bounce but less control. You can perform more trampoline tricks and trampoline exe﻿﻿rcises, which is deal for gymnasts and athletes. You can also visit our best rectangular trampoline guide for more info. Now that you have a better understanding of your choices, and an idea of the different part, here’s a list of the best trampolines with high weight limits. This model is something for the whole family to enjoy as it holds up to 800 lbs in weight. A solid and sturdy well-made model that has a comfortable padded mat to relieve impact. All Season: The great thing about this trampoline is that you can get enjoyment all year around. The jumping mat is made with 6x cross sewed Polypropylene and is UV treated. No Singer User Restriction: Because of the high weight capacity, there’s no need to fret about whether or not someone will be able to use it. That’s why this a trampoline truly meant for everyone, which is why it’s in the top 100 on Amazon’s sports and recreation list. 5 Year Warranty: Some trampolines don’t offer the peace of mind for a consumer when it comes to product’s efficiency. With Acon, they are so confident, that they are backing this with a 5 year warranty, which is quite generous. Enclosure Net Door: One of the best features about this trampoline other than the heavy weight capacity is the enclosure net. Enclosure nets have reduced accidents in the backyard since their arrival onto trampolines. 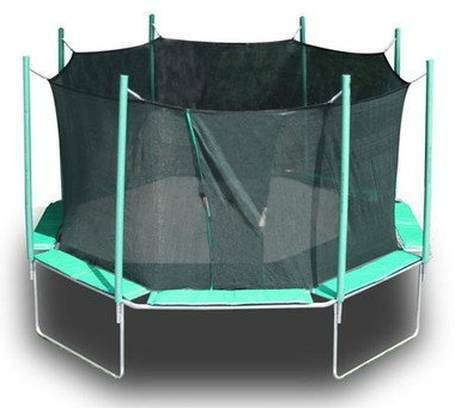 Another thing to consider is access and with this trampoline, you get a convenient door on the enclosure net for easy entry and exit access. ​Springs are corrosion resistant for better durability. ​Designed for kids and adults. Trampoline height is 36 inches giving this great clearance. Assembly can be a little challenging. Many customers claim to have had a harder time putting it together. Patience will be needed. Trampoline with 500 lb Weight Limit: Usually when a trampoline carries such an impressive weight capacity, it can only mean one thing...heavy shipping weight. This trampoline is only 123 pounds, which is a feather compared to others. 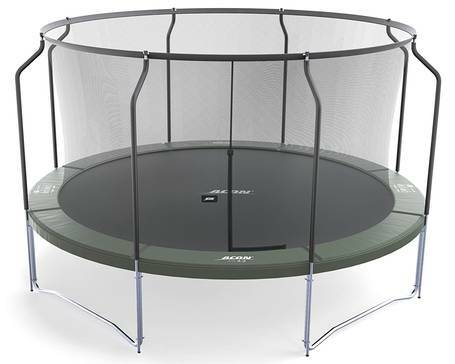 While allowing for less weight than the Acon, this trampoline is a heavy duty model, that can definitely provide fun for your children and their friends. Durable Safety Enclosure Net: One of the more impressive components on this trampoline is its 100 percent premium Terylene mesh dual closure net. It has a dual zipper for convenience and comes with a latch clip for simple use. The net features great visibility, so that the family can have fun but also see around them. With the net, the trampoline gives you over a 100 inches of height for maximum clearance. No Gaps: The enclosure net is a highlight for this high capacity weight trampoline, but so isn’t its great engineering. The whole trampoline has great length with 150.4x 74 inches of jumping surface, that produces no gaps, so that you know your child won’t get their foot caught up by a gap in the side causing the risk of injury. High Quality Spring Action: The better the springs, the better the bounce. That much is true with the Upper Bounce Rectangular Trampoline Enclosure, as it features a rust free spring system that is heavy duty and galvanized for added strength and maximum bounce. Various warranties on pads, metal parts, jump mat, and other components. Great length to the trampoline. ​Stable and durable curved pole that has a top ring. Net has been reported to sag at times. The directions are confusing to many customers. 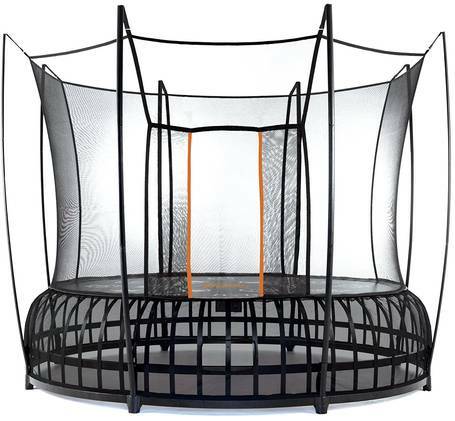 Integrated Safety Cage: This heavy weight capacity trampoline is designed to reduce the possibility of children getting caught up on the mat gaps. The mat and cage is actually sewn together making the cage move with the mat eliminating any possibility of openings. With 350 PSI tensile strength on the jumping mat, this makes the Octagon Magic Circle a sturdy trampoline that will last for years. The cage is tightly made with mesh as well so that it will prevent any possibility of hand injuries too. Superior Bounce: The bouncing performance on this trampoline is incredible. Many customers love the spring action they get with this trampoline. The Magic Circle 16 footer comes with 112 8.5” tapered springs. Spacious: Not only is this trampoline spacious, it is held secure by the welded sockets on the poles to secure the cage into place and provide stability when it’s in use. You get three feet from top to bottom, 172 inches from side to side, and 192 inches from front to back. With that kind of jumping space, you’ll be able to safely enjoy group and family fun. UV Protection: One of the things you need to consider when you buy a trampoline is, whether or not the trampoline is safe to keep out in the sun for long periods of time. If it isn’t, then it’s a pointless venture right? That’s exactly where the trampoline will be is out in the sun, and with this Octagon Magic Circle Trampoline, you don’t have to worry about it wearing or deteriorating, because it is UV protected. This will keep the color of your trampoline for many years to come. Made in U.S. so you know that it is made with quality. Transparent net gives great visibility. Designed for children, teens and adults. Superior bounce, maximum weight capacity, that can house and tolerate a big size family, this trampoline is safe and well constructed. Whether you have little ones or teens, you won’t have to worry about them getting injured on this trampoline. This trampoline has been tried and tested and meets many industry standards including: ASTM, GST, TUV and it has been approved for UV protective pads. Safety First: If you need a trampoline with 400 lb weight limit, this should hold up just fine despite the 375 limit. Again, you’ll want to proceed with caution. What also makes this a safe trampoline for the family are the heavy duty pads on the springs. You don’t have to worry about getting punctured by a spring or your mat and padding. Ladder Included: So many times, you’ll see a trampoline that doesn’t come with a ladder, which makes no sense and is pretty cheap. The Exacme TUV Approved Trampoline does. The ladder included is slip resistant on the rungs and can be secured over the frame and under the safety pads with its hook. PE Mesh Net: The net is made with PE mesh, which makes it expandable and more durable for longer use. But it also makes it much more transparent, so that you can actually see what you’re doing when you are jumping around the backyard. With the safety enclosure net, the trampoline goes up to 9 feet. The net comes with sturdy straps and ropes to keep it ultra secure, while a zipper is built in to open and close the closure door. No Special Tools Or Drills Needed: The assembly on this trampoline with high weight limit is basic and easy to do. Most customers say they put this trampoline together in about three hours, which is right around industry time standards. The instructions are easy to follow and easy to read. TUV, GST and ASTM approved. PVC padding resistant to wear. PE mats are durable and can withstand impact and pressure. Warranty is only 90 days and could be longer. 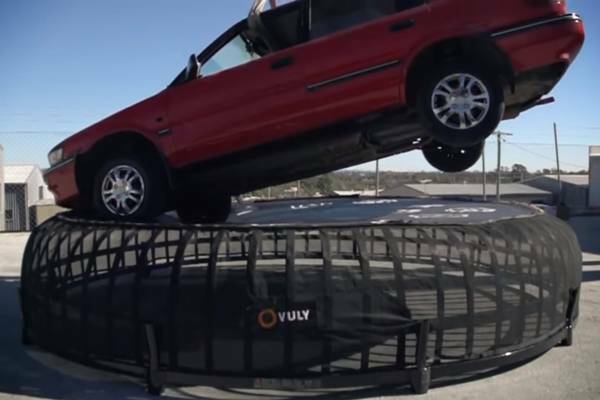 The owner, Mark Publicover, is a revolutionary innovator, who actually invented the trampoline enclosure reducing injuries and improving safety. AlleyOOP is also one of the best trampoline brands out there. Lifetime Warranty: It’s always nice to get a warranty on a product. The usual industry standard can be anywhere from 90 days to 2 years, but with the AlleyOOP 10’x17’ you get a lifetime warranty to give you a comforting peace of mind. Patented Power Bounce Tech: Publicover and Jump Sport really pulled out the works for this trampoline. The power bounce tech is another layer of a spring system, that can be adjusted or tuned for different weight limits and age groups. 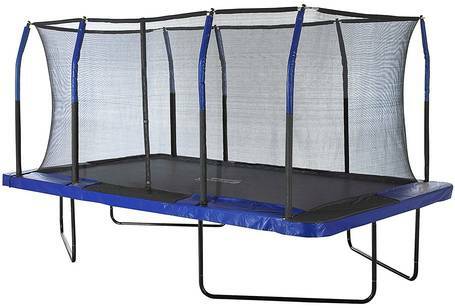 You could adjust the springs to activity as well, which really makes this one of the more versatile trampolines on the market today. Rest Stop: With this technology, your trampoline has more bounce and better shock absorption. The springs are zinc plated steel, 10 inches and made with actual music wire and special coating for maximum mobility. The black springs fall under an unprecedented 5 year warranty. This is a unique feature,which customers are saying they really love. The rest area gives you and your kids a chance to take a break in the action, but without having to leave the area or trampoline. It comes equipped with great padding and vertical net with outside mounting. With the reinforced foam, 21 ounce PVC covering, you’ll enjoy the comfort and durability of the padding. No Clipper Doorway: The innovation doesn’t stop, the AlleyOOP Power Bounce 350 pound weight limit Trampoline can’t be unopened or unzipped. It’s an overlapping patented doorway with 360 degree protection made of high quality mesh material and easy to set up. Single user limit 350 pounds. Designed for everyone, 6 years old and up. ​Maximum weight capacity can hold 800 pounds combined. Durable Frame: Some trampolines can bend and sag over time, which is why it’s important to find a trampoline that has a deep galvanized steel tube frame. With 42mm in diameter, you won’t have to worry about compromises in this trampolines structural integrity. T Spring Pull Tool Included: Life is made much easier during assembly, when you have a T Spring Pull Tool handy. This will make the operation much faster, and ensure that you are getting each spring in securely and correctly. Make sure you wear gloves for protection as springs can be harsh on the hands at times. Weather Resistant Ground Stakes: Holding down the trampoline are six wind stakes, that are weather resistant and easy to install. Zupapa even throws in a pair of gloves to make it easier on your hands. These wind stake can withstand any gale winds or tough breezes, so that your trampoline is never at risk of blowing away or over. Rain Protection: Weather is a natural element, that you’ll have to deal with when you own a trampoline. As it sits out in your backyard, you will want the proper coverage and assurance, so that the trampoline doesn’t wear or discolor. With the Zupapa heavy weight capacity trampoline, you won’t have to worry as a rain cover is included to protect your mat and padding from dampness or rain. Assembly video is included to make operation smoother and easier. 10 years or older: If you have younger children, this trampoline isn’t ideal for them. Only a 1-6 month extension warranty. Comes in three boxes, which could possibly show up at different times. This will delay your assembly. The Zupapa TUV Approved Trampoline With Enclosure is definitely a safer option, that doesn’t have all the glitz and glam that the AlleyOOP does. If the Zupapa doesn’t impress you, then this trampoline with a 300 pound weight limit should. The Vuly Thunder Trampoline is considered by its company as being the “strongest trampoline” in the entire world. They say with the consideration of having an all-Australian team of industry designers and safety experts. 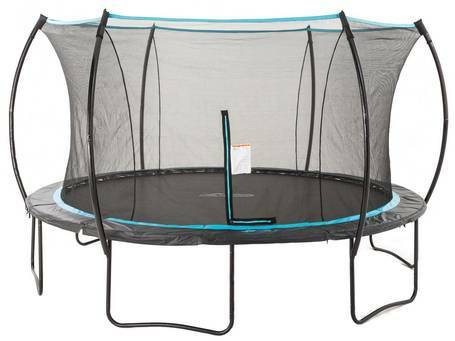 Check latest prices here and stop wondering: how much does a trampoline cost? Spring Leaf System: What separates this trampo﻿﻿line from the rest is the spring system. This trampoline has a lot of bounce to it because of how the springs were engineered during production. The spring used in this Vuly Thunder Trampoline is also used in heavy duty truck suspension systems, which will provide you and your guests with optimal bouncing. The Spring Leaf System creates an energetic and effortless bounce, that involves less movement on your end. Comfortable Safety Pads: Where the Vuly Thunder Trampoline strikes gold is how they make this product efficient and comfortable at a reasonable price. This is very true with their padding, to protect you from further injury, but also for the padding to absorb most of the impact if not all. The pads on this trampoline are made with double sided weather and fade resistant foam material. This will give your trampoline a much longer shelf life, while keeping your muscles and body relaxed much more efficiently. Silky Enclosure Net: An enclosure is meant to keep your children safe from bouncing off the trampoline. But what good does it do, if each time you hit the net, it grazes and aggravates your skin? The Vuly Thunder is made with strong yet soft UV treated silky feeling Terylene enclosure net. It’s also sewn to the mat, so you don’t have to worry about gaps. The benefit of this type of netting system is of course the idea that your hands and fingers won’t get caught up thanks to the grade A cloth, Terylene. The Easiest Assembly: Assembly on the Vuly Thunder is consisting of six components. It has a lock button that you’ll just simply click together, eliminating bolts or nuts and the aggravation. Part of the project is the assembly, which can be a deterrent from buying one. Vuly took the hard part and made it much more simpler for you. Over 14 feet of width. Solid e-coated Steel for long-lasting durability. Vuly: winner of International Good Design Award in Sydney, Australia. Heavy shipping weight, 480 pounds. This is the perfect trampoline for a small family with little children. It has all of the safety features you could ask for in a trampoline, especially with the netting system’s design. Simplicity: Some trampolines with high weight limits can be exhausting during the set-up. Most times, the instructions are from another planet, and it take a group lift just to get the box into the backyard. All things considered, the shipping weight on this trampoline in comparison with similar models is light at 200 pounds. 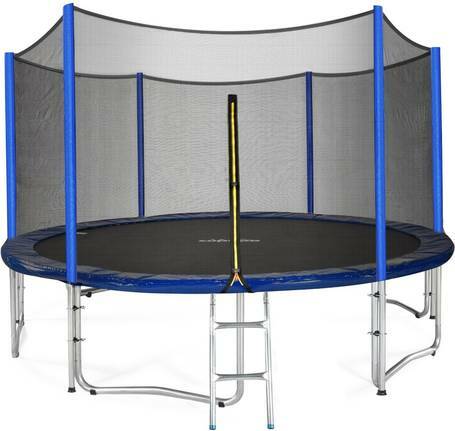 Not to mention, you won’t have to use bolts, brackets or screws to put it together as this Cirrus 14 Ft. Trampoline comes with a push pin for easy assembly. Germ Free Safety Pad: One of the things, that will really stand out to you, is the safety pad. Skybound went to the sky with how they made their pads. A special coating and finish provides an antibacterial and antifungal properties, which keeps those little ones healthier and safer. Less germs, less fade, more of a shelf life for your pads and trampoline. It is also weather resistant for all season use. Great Containment: The enclosure net is a high density 100g m2 concave, which makes extremely viable and strong but also allows for better containment and less sag. With the 6 spot welded galvanized steel enclosure pools, your trampoline adventures will be getting the maximum stability you need. Also, the trampoline netting enclosure comes with a proprietary vinyl film coated foam that covers the pool to keep everyone even safer. 10 Year Warranty: If in the event, your trampoline is to compromise in value, you’ll love the fact that the Skybound Cirrus 14 foot Trampoline frame comes with a ten year warranty for extra peace of mind. This trampoline would be a great option to build an in ground trampoline. Stylish design on enclosure net. Lacing the safety net can be somewhat of a pain to do. Takes some time and patience to do. If you are tired of a trampoline that doesn’t stand out much, then the Skybound Cirrus 14 Ft. Trampoline is the one you’ve been waiting for. The appealing and elegant safety enclosure net system will really radiate your backyard and make the neighbors jealous. Weather Resistant: One of the worst parts of a trampoline to worry about are the pads. If the pads aren’t made right and according to weather, they’ll wear down and suffer structural damage. This will render them useless, as you’ll get less impact absorption. With Propel, you won’t have to worry about gradual wear from the elements, because it is made with weather resistant safety pads. The thickness still has a lot of cushion to it as well. Propel has a reputation of producing secure padding systems because of their trademarked “sure lock” feature, which holds the padding in place. 108 Springs For More Bounce: A lot of models of this magnitude usually provide about 70-90 springs. While that’s plenty enough to have a good time, Propel took it further and didn’t cheap out with their 108 spring up system. This will produce more maximum bouncing for maximum fun. Free Anchor Kit Included: It’s always nice to get something free included, right? But when that free “something” is a necessary feature, such as the anchor kit, which adds to the stability of the whole frame and pad, it is great. The anchor kit can withstand the strongest winds or gales, and keep your trampoline from blowing away and into your neighbor's yard. This will give you a great deal of reassurance that your property is safe and secure. Affordable: With a standard T-bracket system keeping the frame stable, and a standard safety net enclosure, both durable and safe, Propel is able to keep the retail price down. One of the biggest compliments about their trampolines are the value you get for the price. Considering this is one of the least expensive units on the market for a trampoline with a weight limit over 250 pounds, you are getting a great deal. 15 feet in diameter for plenty of bouncing. Not designed for children under 10. Instructions for assembly can be vague. The assembly itself is easy. No spring tool included for added convenience. 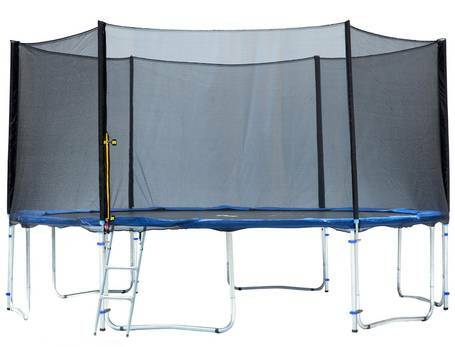 If you have teens and are on a tight budget, then the Propel 15’ Enclosed Trampoline will get the job done. Trampolines are a lot of fun, but if you aren’t prepared and do your research ahead of time, it will make things much more difficult and you could end up hurt and with a trampoline you don’t want. Is It Kid Friendly? Some trampolines as you just read above have age limits that they are designed for. Some even come with handlebars to make sure that your little ones are as safe as they can be. Does It Have An Enclosure? All of the models on this list do have a safety enclosure, which a great idea, especially if you have children. Certain models do allow for the option of having a no-net system. Is It All Season Or UV Protected? Do yourself a favor, and spend a little more on a model that is TUV approved for protecting your trampoline against weather and the sun. This will help add more life to your product. Does It Meet Or Exceed Industry Standards? If you are buying this for your family, then the safety is in your hands. Don’t buy a trampoline that skimps on safety value. As you read from above, you can find models that are TUV, ASTM, GE, Etc approved. How Much Weight Do I Need? This review is a list for heavy weight capacity trampolines. You can find trampolines that cater more to single users than a trampoline with high weight limits. Also, if you do have overweight children, or you are overweight, you will want to look for the appropriate model or trampoline for overweight people. Make sure you have enough space for your trampoline. Make sure you read the age and weight restrictions/limits. Keep your trampoline from hard and dangerous objects. You should always have one jumper at a time. If your younger kids are using trampoline, there should always be adult supervision. 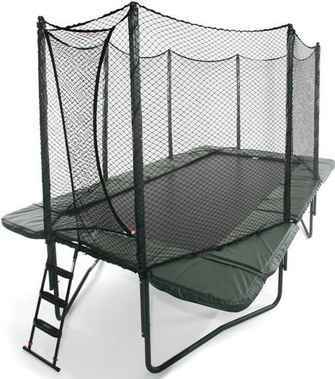 With so many models out there, it can hard to find the right heavy weight capacity trampoline for you and your family. If you follow the advice of this guide, however, picking out your next trampoline with a 300 lb weight limit will be a breeze. The most important point of emphasis is having fun but being safe in the meantime. Finding the right trampoline with high weight limits is crucial, as you don’t want a model that can’t handle your family’s weight requirement. Trampolines have been around for over 70 years, and provide an excellent way to keep in shape, bring the family together, and have fun in a safe manner.